Employee engagement is a real problem for companies worldwide. Recent research shows that only about 13 percent of employees worldwide are engaged in their positions and it points to the issue that leaders are sinking and it is time to send in the TIGERS 6 Principles. A lack of engagement isn’t just a minor leadership concern. It causes several different problems throughout the workplace, including high turnover, high employee absent rates, theft and a loss of profitability due to lost productivity. We also know that engagement trickles from the top down and is a symptom of work culture problems, which are forged and maintained through leadership behavior. If leaders are not engaged, their subordinates won’t be either. A lack of employee engagement can also contribute to workplace toxicity and toxic employee behavior. This behavior includes passive-aggressiveness, bullying, and workplace hostility that spreads to team members. For the most part, engagement problems are a direct result of leaders who have been advanced into position with little experience or skill in managing individuals and building cooperation and collaboration in the workplace. With so much riding on leaders’ shoulders, what can be done to improve engagement levels? The answer is to start with integrating six principles that build high performance teams through improved behavior and practice. The six principles are trust, interdependence, genuineness, empathy, risk and success. An easy way to remember them is TIGERS®..
One problem for many leaders is simply a lack of knowledge on how to lead with six principled behaviors and then handle problems as they arise. This issue can easily be solved by empowering your leaders by giving them the support and skills they need to manage effectively. This can be achieved by providing additional training, real-time feedback and coaching and learning opportunities to improve their skills. At the same time, avoid one-off training programs. Leadership skill development includes practice that aligns with department initiatives. So a good program will give leaders continued access to the training for a period of time and a way to record progress through decreases in costs and increases in productivity. This is the way you know your leadership training is actually successful. Beginning classes should focus on actual departmental behavior issues. This comes through surveying employees so their candid responses point to department behavior problems and then shore up those areas with effective training that gives leaders corrective solutions to existing problems. The bottom line is that both team and leadership development do not respond well to cookie cutter training that fails to deal with the real world problems at hand. Once leaders are supported through training, they are better equipped to handle their current positions and to hone in on skills that directly impact their personal professional development. As they improve their skills, learning opportunities can include more advanced information to keep leaders constantly improving and better equipped to handle problems as they arise. After the hustle and bustle of all that the end of the year has to offer, the New Year provides the perfect opportunity for leaders to refocus their efforts and redefine their goals for the coming year. Although every business and every person is different, business needs are constantly evolving, so it makes sense that leadership styles need to adapt and evolve as well to meet the needs of the current environment. Take some time to reflect on your successes and failures, and refocus your efforts on better managing your team members and improving performances over the coming year. And even when it’s not the New Year, leaders can take the time to refocus their efforts anytime they feel it necessary. Spend more time in team huddles and less time in meetings. Practice courage by embracing failure. Get on the same page as your employees. Overcome your fear of taking appropriate risk. Fear is a realistic emotion and part of life, but if you let your fears control you, then failure often follows. This is especially true when they let unrealistic fears dictate their decisions in business. One way to overcome this is by looking at the entire picture, rather than just focusing on a small detail. When you look at the benefits of taking a calculated risk or the positive possibilities of making a change, then you will feel empowered and will be more likely to take the plunge and look past your fears. Another way to overcome fear is by recognizing that you are afraid, but rather than run, lean in. This may be easier said than done for some, but empowerment comes not from not being afraid, but by being afraid and doing it anyway, whatever it is. In business, this could be as simple as sharing an idea that you have. If this seems difficult for you, consider doing something small each day that scares you or that takes you out of your comfort zone. The more you do it, the easier it will be. Employee engagement is important for a number of reasons, including fewer absences, lower turnover rates, reduced theft and shrink and increased productivity and profitability. When employee engagement is lacking, which it is worldwide with only 13 percent of employees engaged worldwide, then the whole company suffers. For the most part, a lack of employee engagement falls onto their direct managers, as poor leadership skills directly correlate to disengaged employees. So to increase employee engagement, leaders need to focus on and implement the TIGERS Six Principles™ so that struggling leaders who want to build more cooperation in their departments have supporting behaviors to lean into. Additional strategies include empowering your leaders to make decisions for themselves; taking the time to refocus your goals, efforts and priorities to meet your current needs; and taking steps to overcome your fears so that you can put your best self forward to make the most of your talents and desires within your position. TIGERS® Success Series is a robust, comprehensive approach to building team cooperation and collaboration between departments by understanding 6 principles that reduce conflict, improve work group efficiency and measurably produce high performance teams. The 6 TIGERS® principles are Trust, Interdependence, Genuineness, Empathy, Risk and Success. 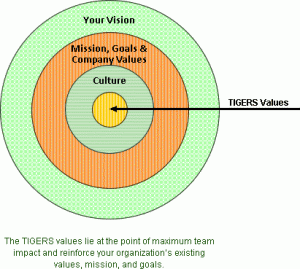 The TIGERS model is sustainable; It is a model that grows with your team and organization. 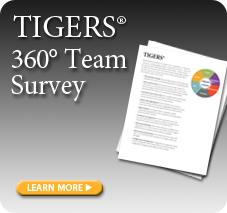 TIGERS is a systematic approach toward team development. The TIGERS Model is not a one-hit wonder. The TIGERS model is designed to continuously improve upon the way teams work.